The San Antonio Area Foundation aboard the good2gether express. Great organization doing important things for nonprofits in San Antonio. We're thrilled to be working with them. 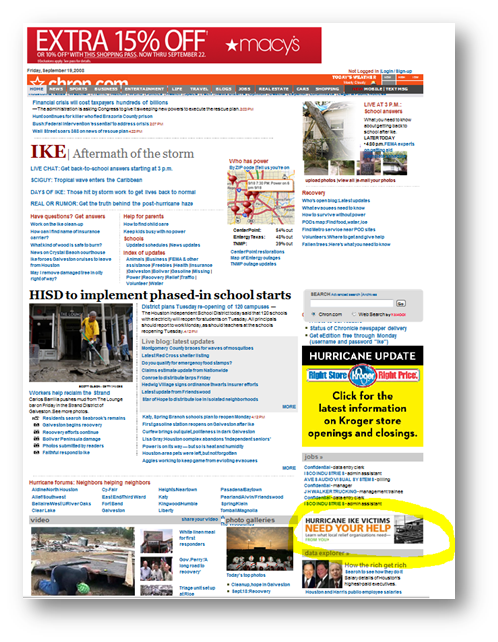 The Houston Chronicle – chron.com – has a link to the Do Good Channel on the home page. The San Antonio Express-News (MySanAntonio.com) was scheduled to go live in October but decided they wanted to get up earlier so here they are – Do Good San Antonio. 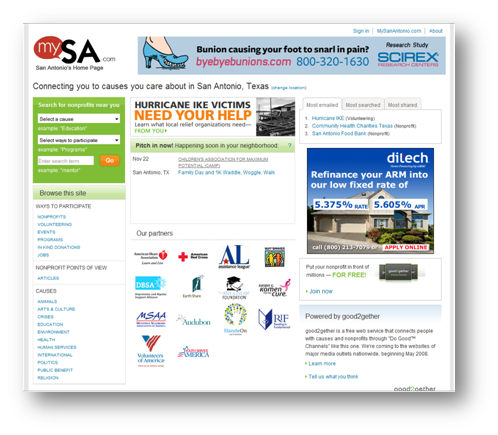 Adding new markets is so very exciting and we welcome our friends in San Antonio to the Do Good world! 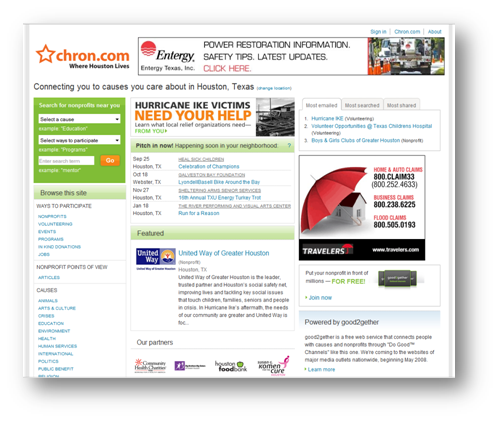 The Houston Chronicle and Chron.com have launched their Do Good Channel. This was originally scheduled for October but they wanted to move it up to help in the response to Ike and our crack team did an amazing job and got it up immediately. Check it out and Do Good in Houston! Our Ike response is up in each of our Do Good Channels in Atlanta, Boston, and San Francisco. And we'll be launching Do Good Channels in TX in the next day or so to help. Go to anyone of the channels and click on 'Ike'. We added four new launch partners this week - three aggregators in three different markets including another United Way (our sixth), another Executive Service Corps (our third), and another Hands On affiliate (our sixth). And this week we had another new local join as a launch partners - our fourteenth Big Brother Big Sister affiliate. Nine new launch partners signed last week. We added seven aggregators in five different markets including another Earth Share Affiliate. We are now up to eight Earth Share affiliates in the launch partner program and another Community Health Charities affiliate, our ninth! Plus, this week we had two new locals join as launch partners, our tenth Big Brother Big Sister affiliate and our tenth Boys & Girls Club affiliate. 08-08-18 AJC Do Good, originally uploaded by Middlesex Fells. 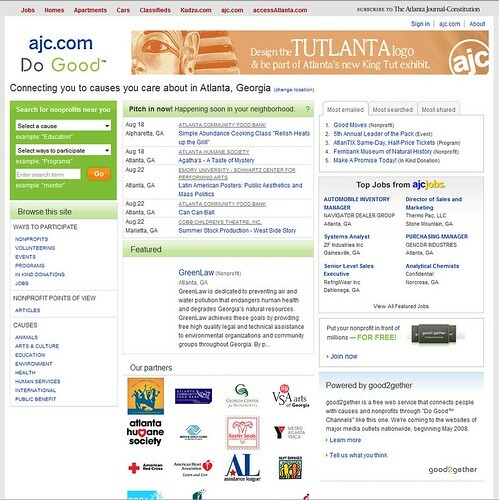 We're thrilled to have the Atlanta Journal Constitution Do Good Channel up and running in addition to Boston and San Francisco. More (much more) to come. Take a look. Poke around. Find some good to do. We're incredibly happy to announce that the Do Good Channel at The San Francisco Chronicle is live. Click here to see our latest Do Good Channel. The good2gether express continues! We added five new launch partners this week - one national organization, one local, and three local aggregators in three different markets.